Yellow jacket wasps are social insects that live in nests or colonies with up to 4,000 workers. Yellow jacket wasps typically feature a yellow and black head or face and patterned abdomen that resembles stripes. There are different types of controls to get rid of wasps. Diet: Yellow jacket wasps eat spiders and insects. They will also feed on human food, especially meats and sweets. Unlike bees, these wasps do not make honey or store food. Habitat: Yellow jacket wasps congregate where humans live. They usually build their nests underground, around rubbish and in cool, dark spaces. Nests may be built in trees, shrubs and in holes in walls. Most colonies only remain active for one year. When the wasp queen flies off to start a new colony, the remaining bees die and the nest is abandoned. Look for yellow jacket nests during the day, because you can see them flying in and out, but destroy nests at night, when they are dormant. Impact: Yellow jacket wasps help farmers by eating other pests that can destroy crops. They are dangerous however because they can sting multiple times and inject venom into the host. 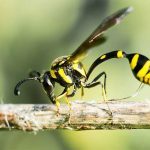 For most people a yellow jacket wasp sting just causes a welt and temporary pain, but their sting can cause allergic reactions to people sensitive to this venom. Change exterior lights to yellow bulbs to reduce this pests’ attraction to your home or property. Keep dust bins sealed and clean and regularly empty them. Promptly remove any fallen fruit from trees, as it attracts the wasps. Do not attempt to remove a wasp nest on your own. Vinegar apparently makes a good bait for water traps designed to capture and get rid of wasps.